Bethel High's girls basketball team is all about ending streaks. Last season the Jaguars ended a 13-year drought of not making the playoffs. On Jan. 31, Bethel ended another big streak. Although Vanden High has owned the Solano County Athletic League recently, Bethel didn't seem to get that memo and defeated the Vikings 75-70 at home. The loss was the first league loss for Vanden in 35 games. One of the biggest reasons that streak is now history was the play of Bethel senior Raquel Torres. "Oh, our team knew about the streak coming into that game," Torres said. "After the buzzer went off during the first game we played with Vanden this season, I knew we could beat them. I just told my team, 'It's okay, we got them when they come back to our house.' "
The 17-year-old senior scored 26 points and grabbed six rebounds in the win for the Jaguars which head coach Paul Davis said may have been the program's biggest in its history. She also scored 14 points in Bethel's win over American Canyon on Thursday. The stellar play from Torres helped her win the Times-Herald's Athlete of the Week award. "Raquel scored 26 points in the win against Vanden, but it was a quiet 26 points," Davis said. "Coming into the game I knew she was going to play well because she just had this certain look in her eyes that said she was all business." Torres said she knew the team had a good chance of winning the game after they withheld a third-quarter run by Vanden that briefly gave the Vikings the lead. "Vanden went up 49-48 and it looked like we were going to give the game away," Torres said. "I told my team we could either lay down and fall or stand up and finish. We do this 30-minute conditioning drill in practice that really helps us in games. I told my teammates that the game was just like practice and to pretend like we were only in the third quarter of our line drills." Torres said as soon as the final buzzer sounded in the win, she was thrilled. "I ran off the court immediately and went to Coach Davis and hugged him," Torres said. "For years me and Chanel (Davis) just wanted to beat Vanden once. If we could just them once before we left Bethel." Torres transferred to Bethel from St. Patrick-St. Vincent High after her freshmen season, citing financial reasons with the tuition as the main reason for coming to Bethel. She said the transition wasn't tough, and she's glad she's helped turn the Bethel program around. Torres hasn't committed to a college yet, but Davis believes any school would be lucky to have her. "Honestly she's a great kid all-around, on and off the court," Davis said. "She's got a great basketball I.Q. and a great jumper. She'd be a really good find for any Division I or Division II school." * Alyssa Wong, Ricki Liang and Frankie Liang- Bethel wresling. Wong and both Liang sisters won section championships Saturday at the Masters tournament at McNair High. Frankie Liang won in the 122-pound weight class, while Ricki Liang won the 114-pound division. Wong came in first place in the 138-pound weight class. Overall, Bethel will send 11 wrestlers to the state tournament. * Tajai Johnson- Vallejo boys basketball. Johnson scored a team-high 26 points in the Apaches Thursday loss to Vanden. * Josh Bynum- Bethel boys basketball. Scored 24 points and had 16 rebounds in Bethel's Thursday win over American Canyon. * Paige Pangelinan- Benicia girls basketball. 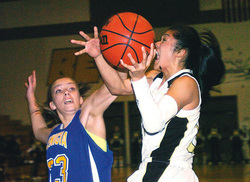 Pangelinan scored a combined 28 points in two Benicia wins during the week.